Long breath. Surfing on the Internet for 8:30 hours and sitting out in the sun in front of a matt screen - Samsung fulfills this scenario for the summer perfectly with its smallest Series 3 model. Find out why it doesn't achieve "Very Good" anyway. 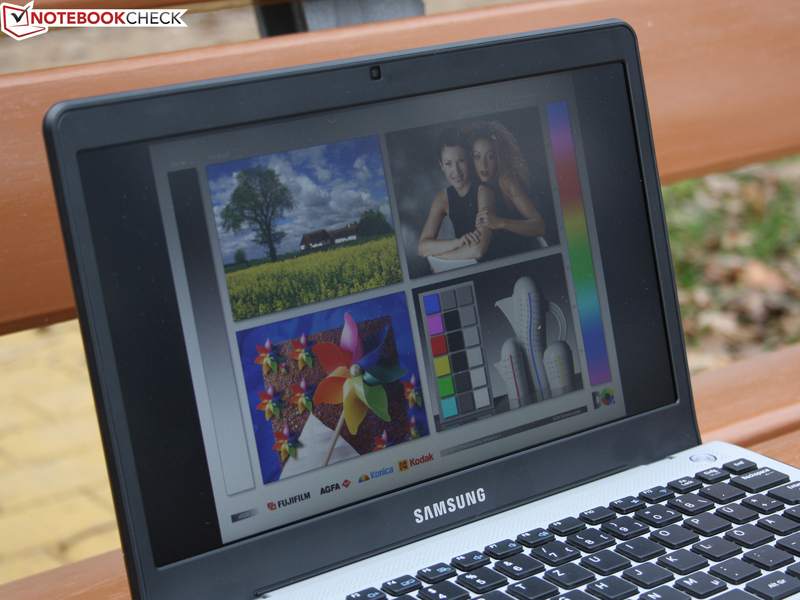 Samsung Series 3 NP-305U1A-A01DE: A low-priced 11.6 inch laptop with long battery runtimes and a soft spot for outdoors? Samsung very secretly pushed an 11.6 inch laptop onto the virtual shelves of retailers. We hear the reader asking: "Where did that come from?" There isn't a word about this Series 3 model on Samsung's German website. The distribution was once more faster than the update team and public relations. 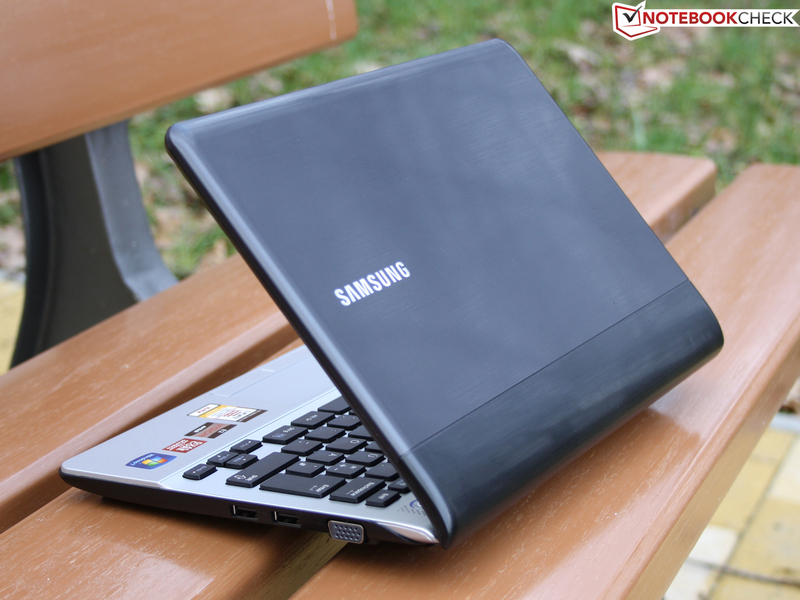 Following the MSI Wind U270, the Samsung Series 3 305U1A is the second subnotebook, respectively netbook with the AMD E Series APU refresh. It is now called E-450 and has a dual core with 1.65 GHz (previously: E-350; 2x 1.60 GHz). The Radeon HD 6320 graphics card could make the difference as it can now overclock a little via Turbo Core. Miniature-sized mobile gaming power? Enormous battery life, fused with a bright, matt screen? We make the comprehensive test that will (hopefully) answer all questions. We will first take a look at the outsides. 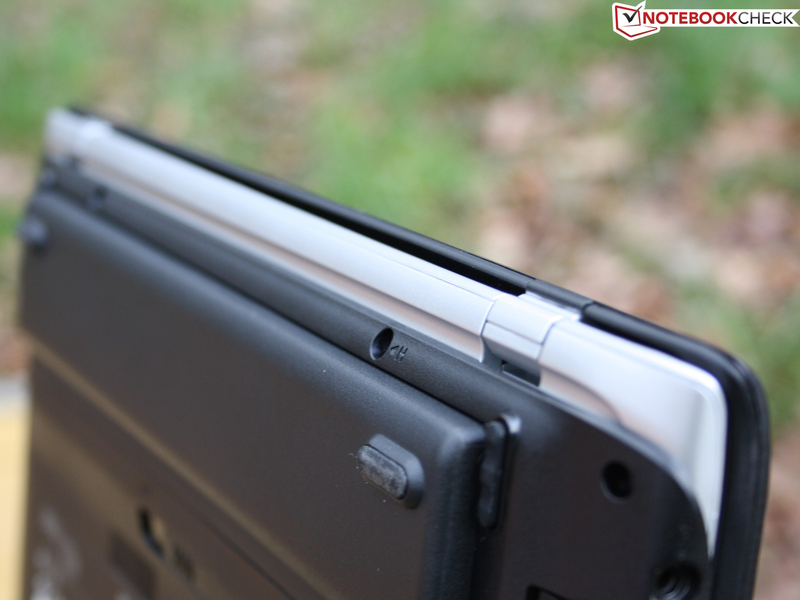 The 11.6 inch notebook is in a slim case. 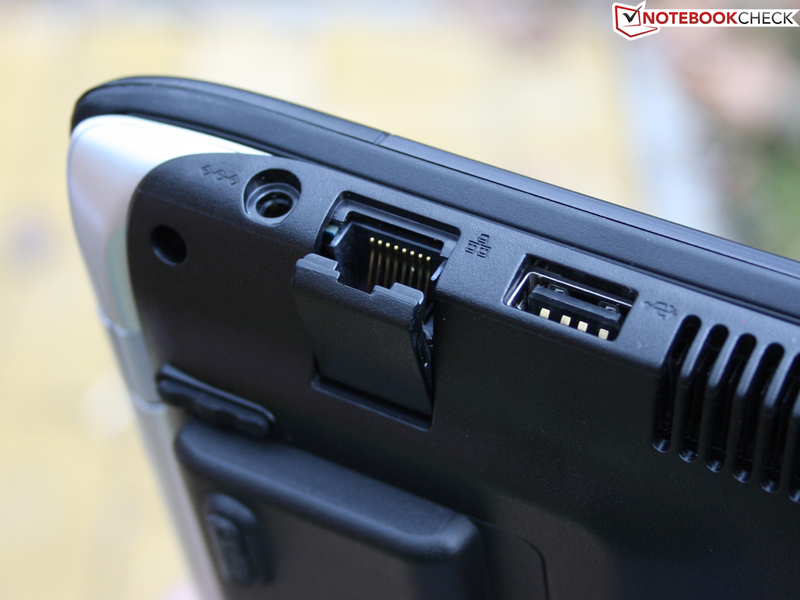 That is, if it weren't for the protruding battery sticking out downward at the thickest area. It has its own rubber feet and lifts the device up slightly at the rear. Consequently, it can no longer be called ultra-slim. The single details and shapes of edges, feet, battery latch and the aluminum bezel look cleanly molded and punched. However, the case is a weak point: On the whole, it is only adequately stable. We can warp the base unit evidently with both hands. The hinges' suspension is afflicted the most: They are mounted to the base unit loosely and cause a wobbly back stop. The lid teeters evidently. The lid's surface is pressure-resistant and doesn't collect many fingerprints because of the brushed surface. We wouldn't take for granted that the polished surface is also scratch-resistant, though. The wrist rest is made of painted plastic but doesn't yield anywhere. The base plate's surface also resists light pressure. The reason may be the omission of a large maintenance opening. There is only a small cover that hides the RAM bar (1x). The hinges can be opened to a narrow opening angle of about 135 degrees. The closing tension that keeps the lid and base unit together isn't very strong. The lid opens three centimeters when the device is held upside down. 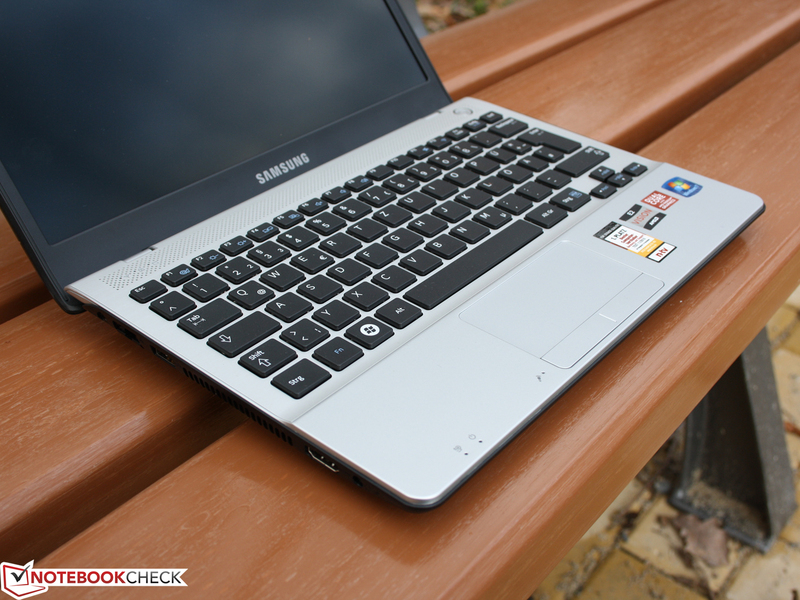 The Samsung 30U1A is modestly, but appropriately equipped for the 11.6 inch category. 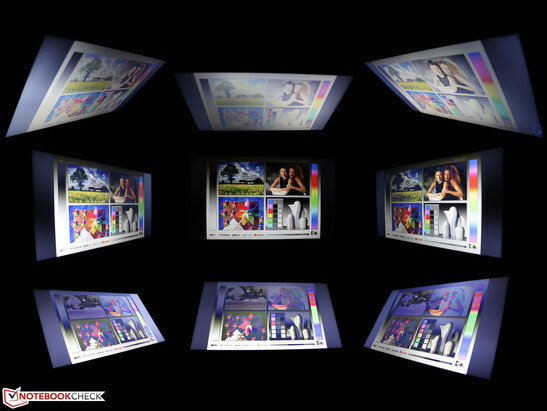 The TV or an external TFT can be connected to the HDMI and VGA ports (audio transmission via HDMI). 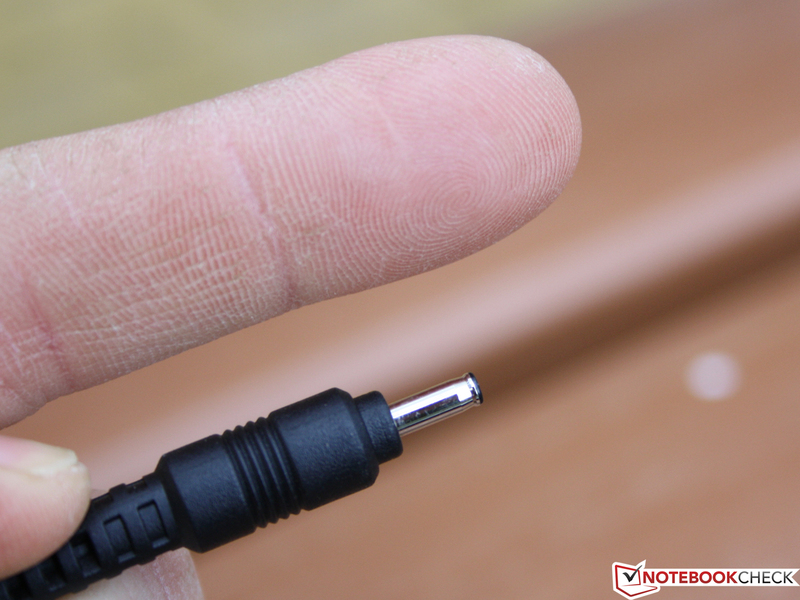 The audio jacks have been reduced to one single micro headphone combo jack. 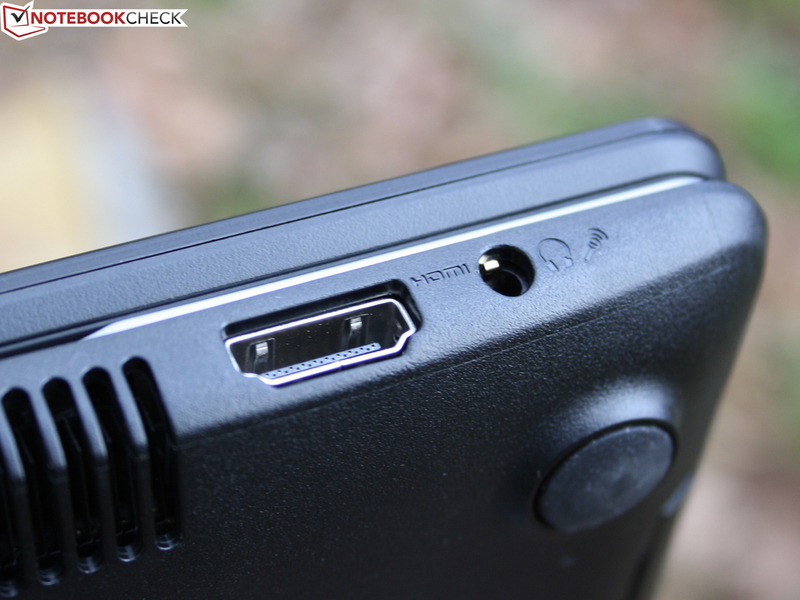 The three USB ports only support the older 2.0 standard. 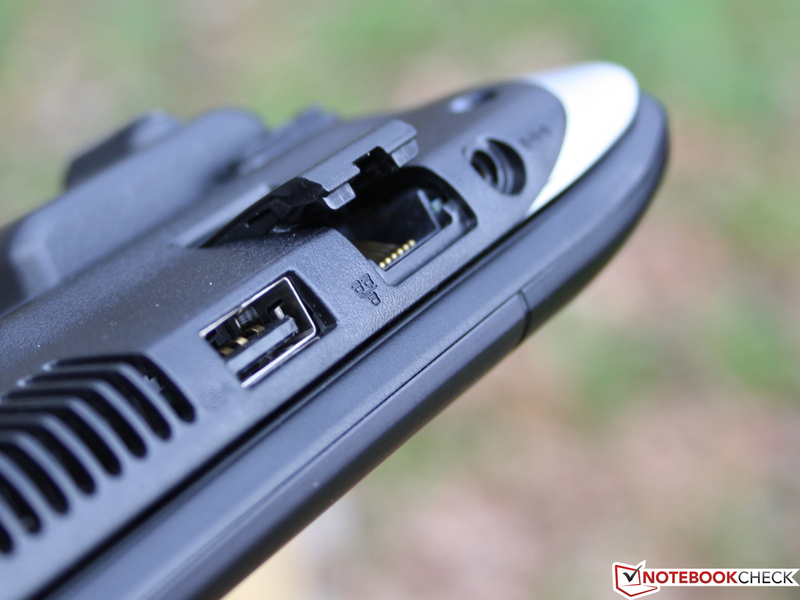 The other ports are standard and thus could also be found on a netbook. The Ethernet port (RJ45) is closed by a flap for space reasons and users who don't use it in preference of WLAN will likely appreciate that. Users who transfer enormous amounts of data over their home network will find the matching equipment in the Realtek PCI-E Gigabit adapter. Wireless connections are appropriately managed via draft-n (Broadcom module). Bluetooth for pairing small devices, like a smartphone, is also installed. However, it's only a 2.1 module. A 3G module for mobile Internet access would match perfectly to the good battery life. But there's no such version for the 305U1A available. The webcam has a sufficiently high resolution of 1280x1024 pixels (1.3 MP). That is enough for video chats and snapshots in all life circumstances. However, there is very evident noise in weak light. Videos can only be recorded in 640x480 pixels (CyberLink YouCam with desktop recorder). 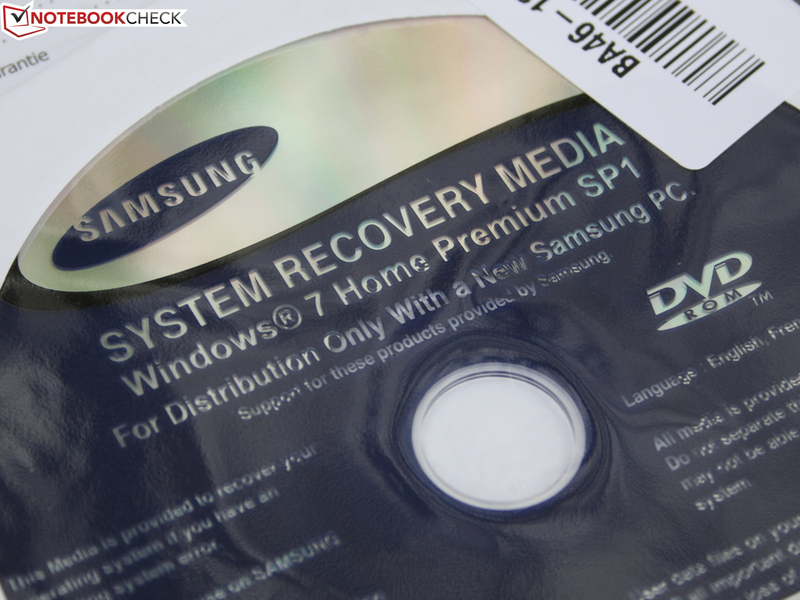 There is a recovery DVD for the Windows 7 Home Premium (64 bit) operating system. Of course an external drive is needed for the DVD. 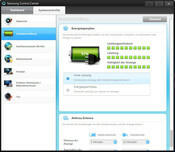 As usual, users can create their own backup image via Samsung's Recovery Solution. Samsung lately bundles its system tools in the Control Center. 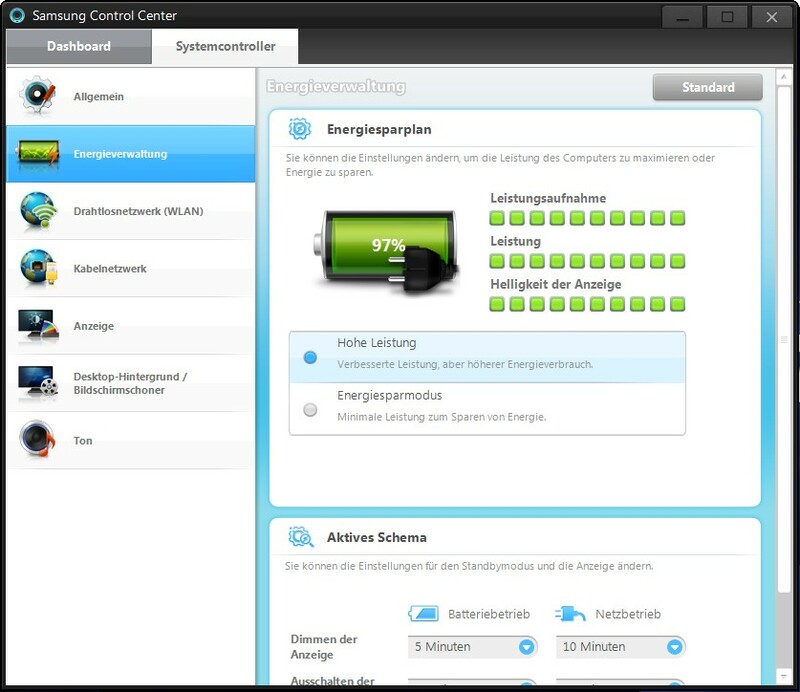 The power options, Battery Life Extender (limits the battery charge to 80%), SpeedBoot (formerly Easy Speed Up Manager), WLAN settings and the screen colors (settings for movie, soft, focused, default). 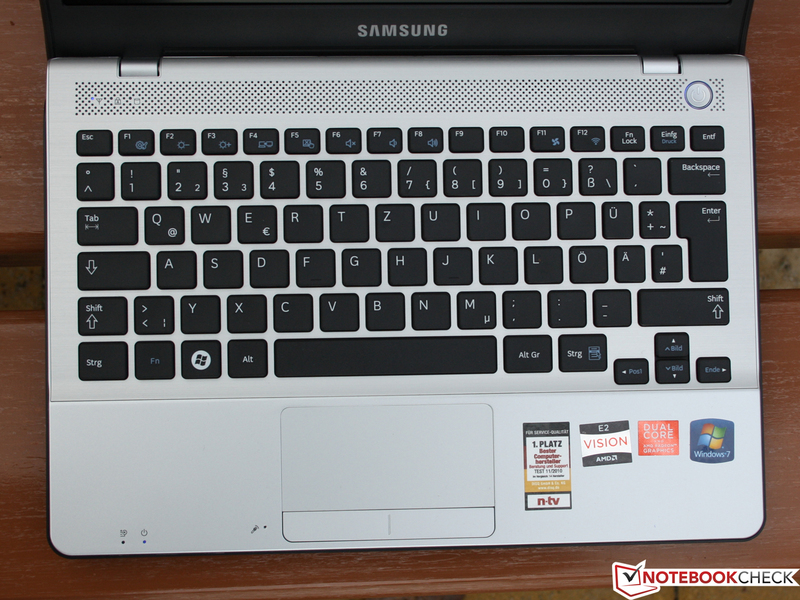 The hybrid standby mode "Fast Start" is found on all Samsung laptops. The waiting time in warm start is reduced to 1-2 seconds. The desktop becomes visible from standby from one second to the next. However, the power supply of the 11.6 inch device shouldn't be interrupted because the information is only saved in the volatile RAM. The manufacturer's warranty is 24 months. This is not a matter of course for a device of this price range. This period can be extended to 36 or 48 months via a service upgrade (collect & return). It has to be activated within 90 days after purchase. This extension costs about €55, respectively €100. The keys have a distinct stroke, clear pressure point and firm stop. The keyboard's entire surface is sufficiently fitted for normal typing. A harder stroke can cause it to yield slightly. 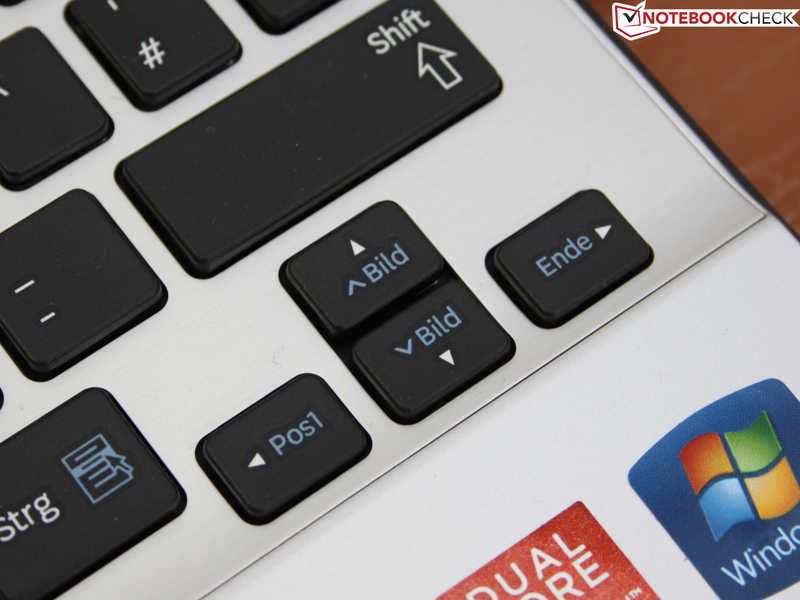 The keys have a large distance to each other and the arrow keys are separated from the others. Marks for touch-typists on the F and J keys are difficult to feel. 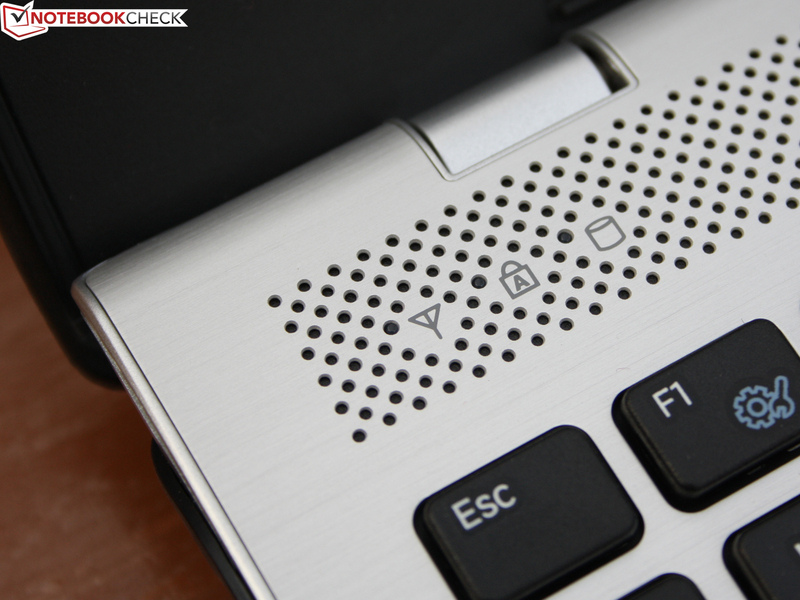 In short: The keyboard is good and particularly the feedback while typing is very pleasant due to the clear key drop. If the keys had a conical inward curve, a "Very Good" would have been due. 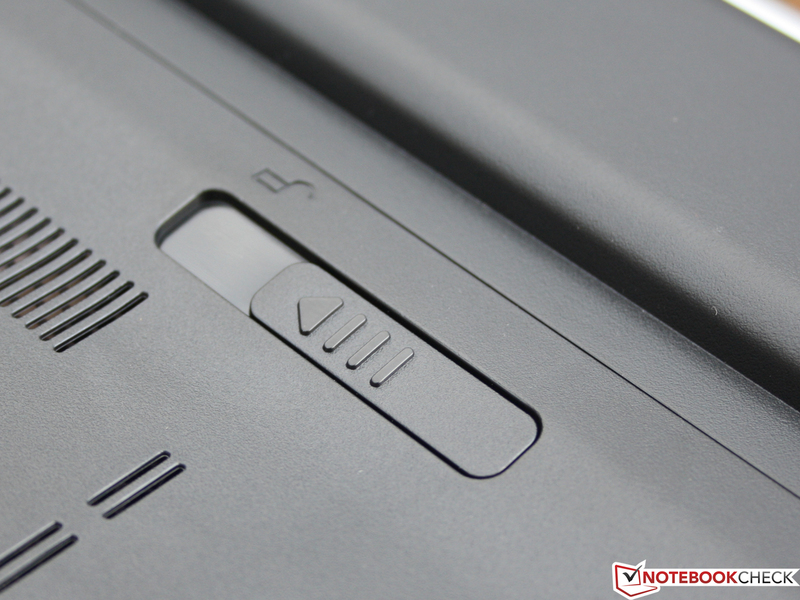 The Elan Smart-Pad offers many settings for customization, as usual. For example, users who prefer using a one-finger scroll bar at the edge can simply enable it. Users who can't get enough of multi-finger gestures can also enable three-finger swiping. Thus, the user can quickly go back to the desktop from any Windows application or switch among Windows. 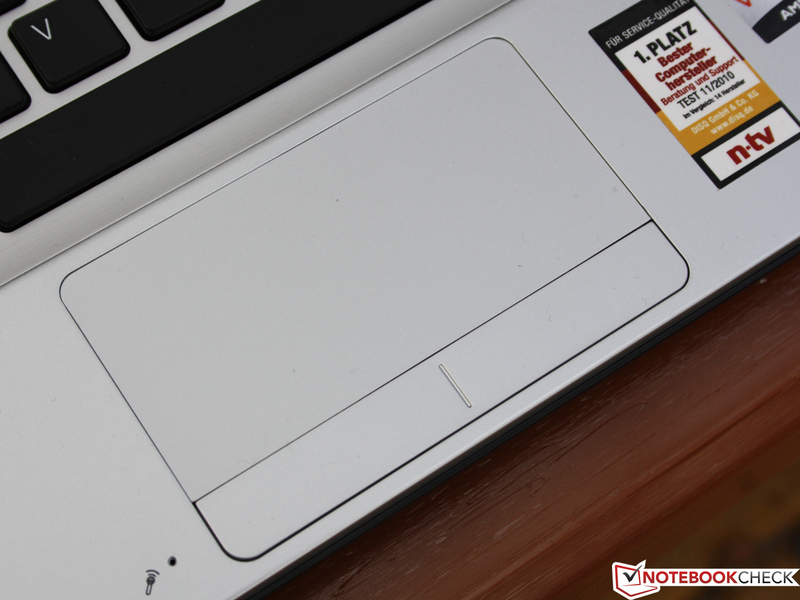 The Elan pad's surface is sensitive up to the edges and pleasantly matt, but not smooth. The pad keys work almost noiselessly, but have a too short key drop. The latter lessens the operating feedback in contrast to the clear key drop of the keyboard. The 11.6 inch screen from Samsung (model LTN116AT01) has a resolution of 1366x768 pixels. This high resolution has become standard in 11.6 inch devices - much to the user's delight. In opposition to the obsolete 10 inch netbook resolution of 1024x600 pixels, it improves the desktop's manageability. The TN screen's contrast of 143:1 is very low but not surprising in this low-priced device category. However, the really important criterion for the Samsung 305U1A's mobile use is its brightness – which is impressive. 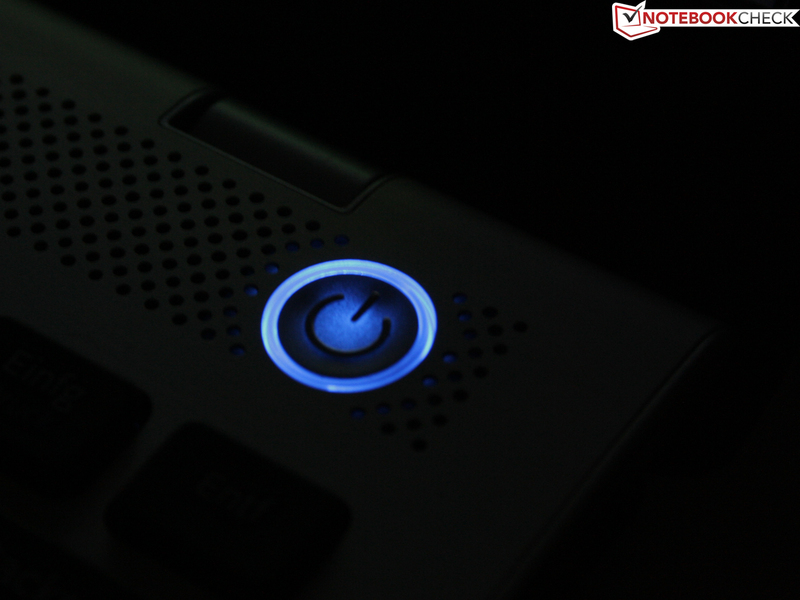 The matt screen has an average brightness of 241 cd/m2, which is even brighter than the majority of office laptops. Important for outdoor use: The brightness isn't reduced on battery power. 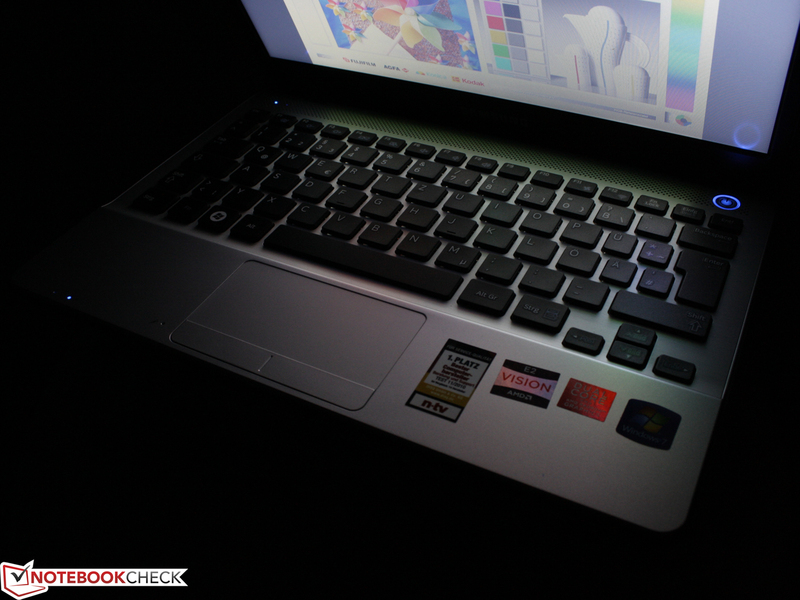 The color spectrum, which we compare with AdobeRGB, sRGB and the screen in the Latitude E6520 FHD as well as the Vaio Z13 (each transparent), is very narrow. Small-sized professional screens are very scarce. Examples would be the (expensive) Vaios of the Z series (FHD & WXGA++, matt). These usually cover at least sRGB (grid in center ICC picture). However, this quality is only important for professional image editors. Samsung makes the right decision and installs a matt TFT. It allows use in daylight and in the sun. The 11.6 inch screen didn't have any problems with legibility in overcast conditions, in which we took our pictures. 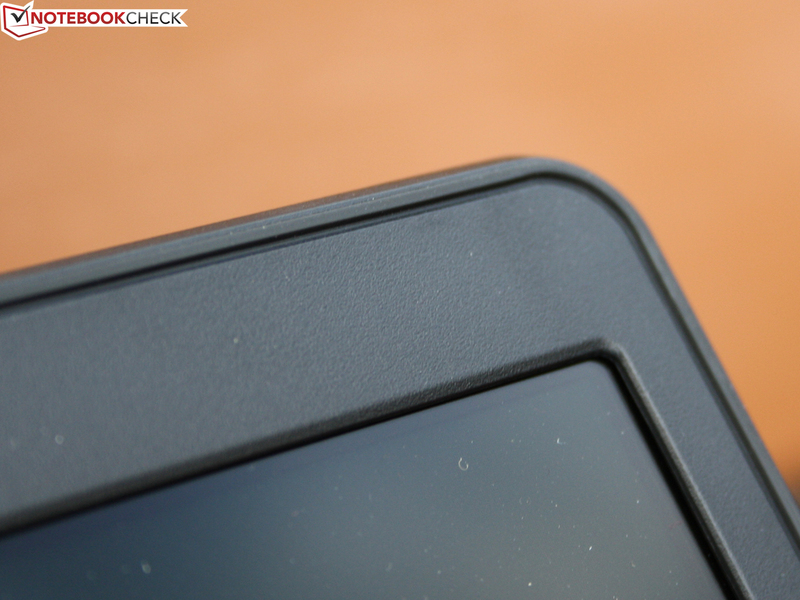 The Samsung 305U1A's viewing angles are viable horizontally, but very poor vertically. The colors remain true up to about 45 degrees. The viewer's eyes may only deviate 15 degrees from above or below before the picture fades vertically. We experience extremely inverted colors at a vertical deviation of 25 degrees. The viewing angle behavior described here is common for about 80% of our test devices (low and medium price range). 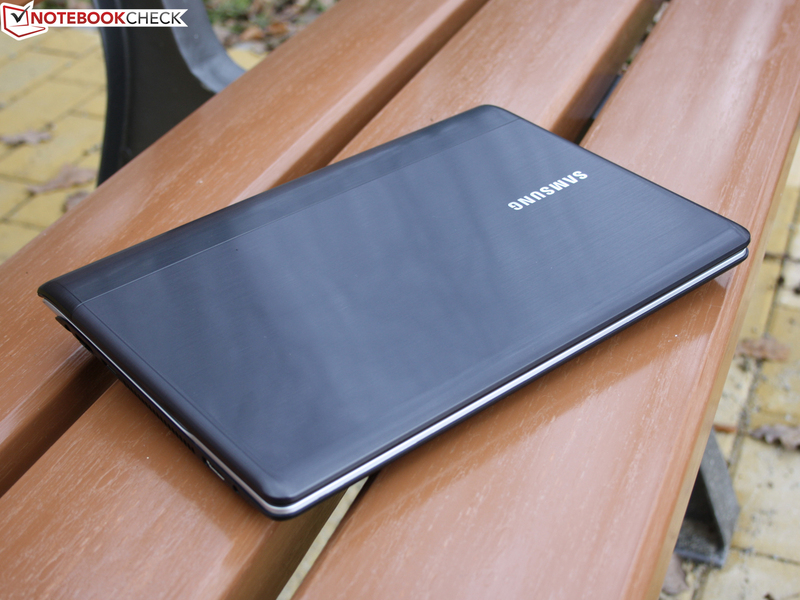 Samsung equips the 11.6 inch laptop with the Bobcat APU, AMD E-450 (2x 1.65 GHz). The so-called Accelerated Processing Unit with a TDP of 18 watts has an integrated graphics unit with DirectX 11 functions and a UVD3 video decoder for HD videos (MPEG-2, H.264, VC-1). 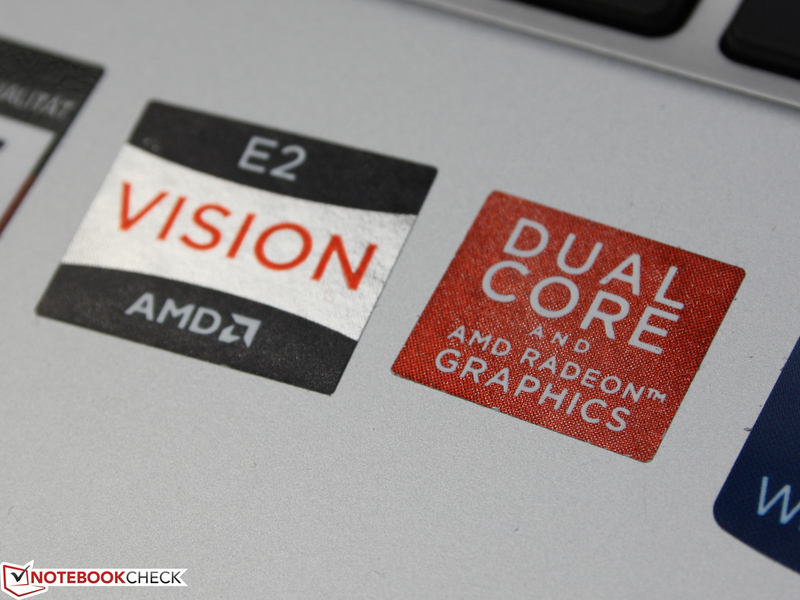 The Radeon HD 6320 beats the latest Intel HD 3000 (notebooks) with 80 shaders and a UVD3 processor. We won't even mention the GMA 3150 (Atom netbooks). The APU only has an L2 cache of 1024 KB. The core sits on the AMD A50M chipset and is accompanied by 4096 MB of DDR2 RAM. Samsung installs the 64 bit Windows 7 Home Premium and the 64 bit APU is exploited perfectly. We compare the AMD E-450 (2x 1.65 GHz) with the previous E-350 (2x 1.60 GHz) and with the Intel Atom dual core N550, still on the market. The Atom dual core has the Hyper Threading advantage of four computing cores. The difference to the E-350 should be low, if at all visible, in the CPU performance. Level 1 and 2 caches are identical (128, respectively 1024 KB). The multi core benchmark, Cinebench R11.5 64bit is to show us if the lack of Hyper Threading is a disadvantage for multitasking operations. The test system achieves 0.64 points. That is equal to all previous E-350 devices: 0.6 points. We don't have a 64 bit score for the N550, so we use Cinebench R10 Multi 32bit: 2027 points for the E-450 and 1400 points for the Atom N550 (average). The E-350 again has an identical score of ~2000 points. The N550 is slower by 30% according to that. The processor can reduce its clock to 800 MHz in idle. The Bobcat cores don't have Turbo (only in Llano APUs), and thus 1.65 GHz is always run in medium and high load. The user can intervene by limiting the clock in the Vision Control Center. The synthetic computing examples don't let the AMD E-450 look better than its predecessor, E-350. But what about the combined application performance of this specific test device? 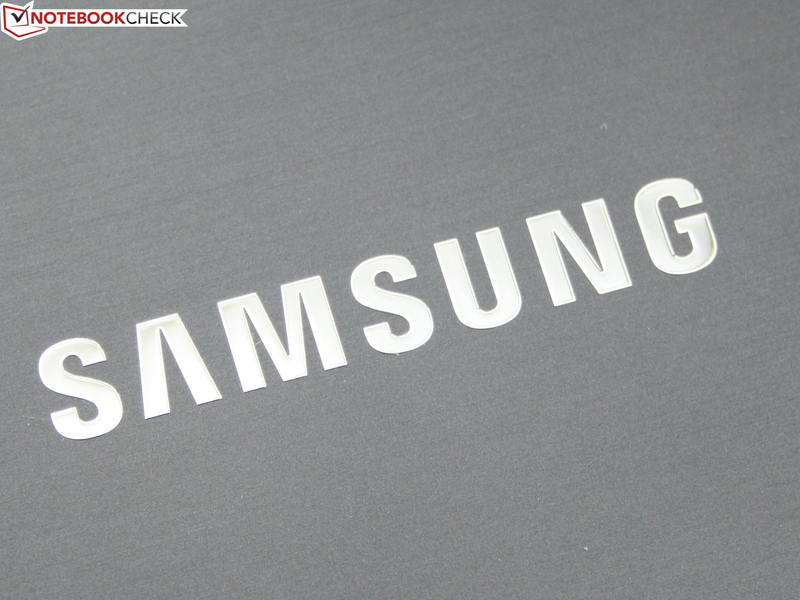 The CPU weak Samsung might also convince with a fast hard disk, respectively SSD, RAM and graphics card (HD 6320). We use PCMark Vantage and PCMark 7, which check all the components as a whole. 2640 points, respectively 1005 points are the tight results. 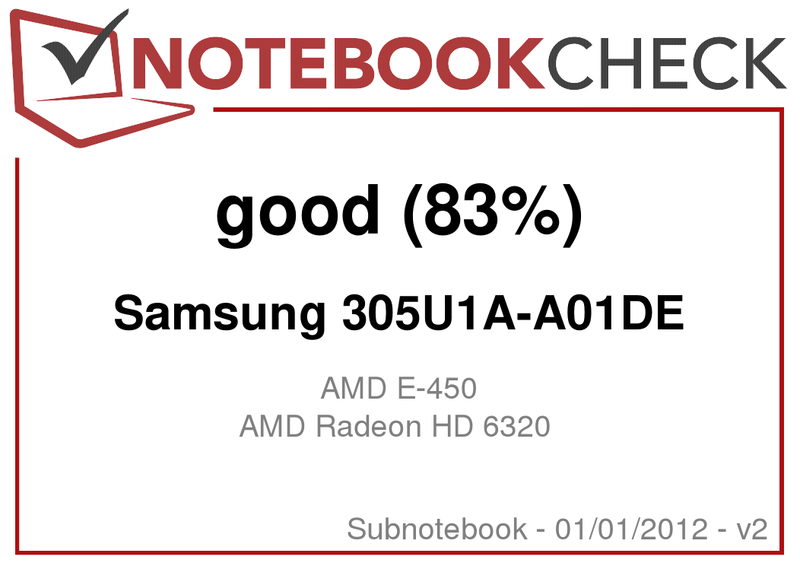 At least the Samsung 305U1A can stand out from the E-350 test range that only achieves 85% of the performance (2250 points). Since the MSI Wind U270 with an E-450 also only manages 2268 points, we ascribe the increased performance to the fast hard disk. The PCMark Vantage gaming score of 2202 points is only marginally higher than with an E-350 (~2000 points). 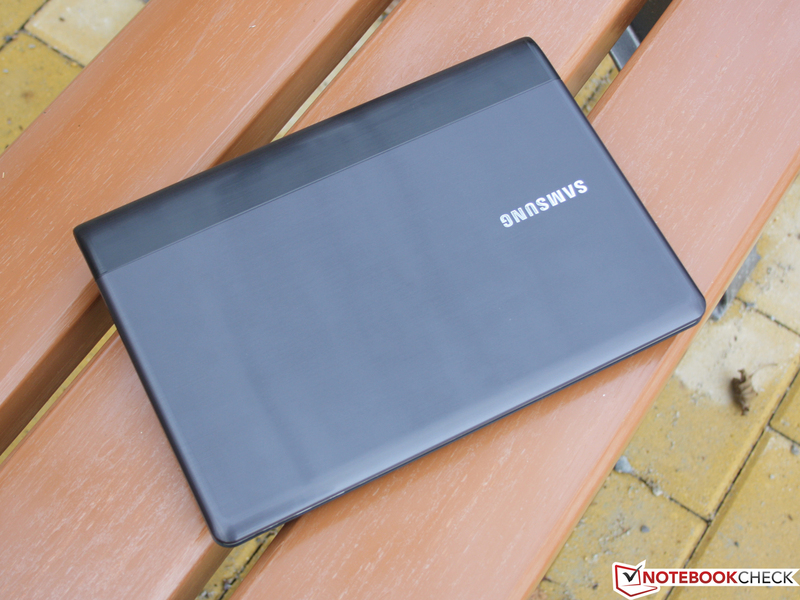 Outside the netbook or Fusion comparisons, it remains to be said that our Samsung 305U1A is significantly weaker than, for example, a simple office device with a Core i3 2330M and integrated Intel graphics. The Asus Pro P53E manages 4810 points, respectively 1768 points (PCM Vantage, PCM 7). However, there is a contrasting picture in 3D performance; see gaming performance. Content Creation with CPU load reduction? Everyone is talking about hardware support via the graphics, which unloads the processor in general calculations via OpenCL, OpenGL or CUDA (Nvidia). The HD 6320 supports OpenCL - can we exploit this? We let our Samsung 305U1A render a video (H.264 FHD 50i) with CyberLink's Power Director 10, which takes 15:40 minutes. GPU support unfortunately isn't achieved even after installing the AMD Media Codec Pack in the latest Catalyst driver. It's also frustrating here that the Asus Pro P53E with an Intel HD and Core i3 standing beside it, renders the same clip in 3:27 minutes, including Intel's QuickSync Video hardware support. Apart from the poor rendering performance, working with Power Director 10 on the Fusion system is amazingly smooth. HDTune reads on average with 72 MB/s. Although this isn't an unusually high rate, it is in the midfield of simple 5400 rpm hard disks. CrystalDiskMark achieves 90 MB/s. This throughput is at the upper end of 5400 rpm HDDs and in the midfield of 7200 HDDs. Samsung could have used a 7200 rpm HDD, but the noise would likely have been overpoweringly loud under certain circumstances. The HDD scores in PCMark Vantage and PCMark 7 add a few points to the high throughputs. 3010 points (PCMV) are however still remote from the 4500 point that a speedy single 5400 rpm HDD could manage. The PCMark 7 Storage score finishes with 1456 points. This can also be seen as midfield; 7200 rpm HDDs are only 10 to 20% faster (e. g. Dell XPS 15z +15 %). More comparison data can be found in the HDD/SSD benchmark chart in FAQs. The AMD Radeon HD 6320 (IGP) is practically the performance behemoth among the integrated graphics units of the AMD C and E series. In comparison to the HD 6310 of the E-350, the clock can now increase from formerly 500 to now 600 MHz via Turbo Core. Since the 80 shaders and the 40 nm manufacturing process hasn't changed, the measurable advantages stay within narrow limits. The old 3DMark 06 gathers 2411 points, which is still 15% more than the E-350 range, e. g. the ThinkPad Edge E325 (2048). However, that can't hold a candle to a HD Graphics 3000. These devices range between 2500 and 4600 points (105 to 190%). 3DMark Vantage finishes with 951 points. The E-350 devices are 15% below that in the best case. The Intel HD is again 119 to 217% faster. 3DMark 11 is newer and finishes with 338 points. The E-350 devices are only slightly below that with 82% of the score. There are no rates available for the Intel HD. The frequently mentioned advantage of an AMD Fusion APU is the high GPU computing performance compared to Intel's processor graphics. 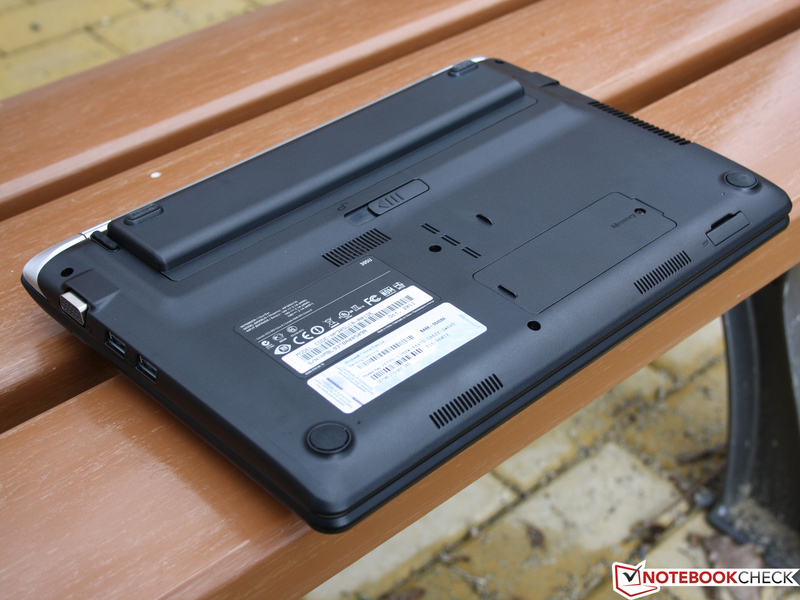 The comparison however only works when netbooks equipped with the Intel Atom N550/N450, available on the market, are compared. This is synonymous with the gaming performance: Our test device can at most beat these weak systems. The 3D performance is extremely low compared to "normal" notebooks - even ones with an Intel processor graphics or low voltage processor. 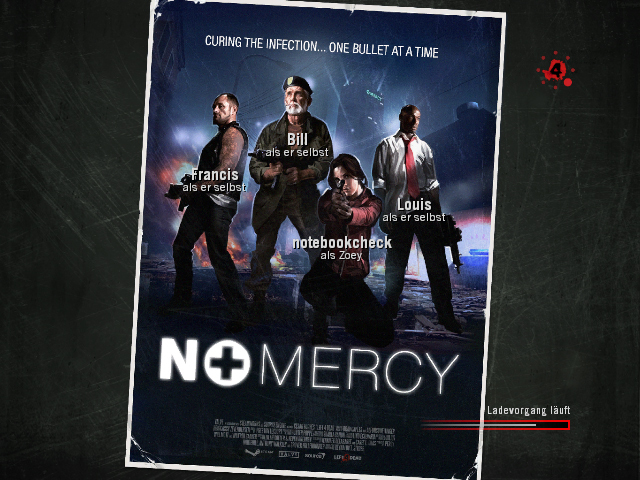 We tried a range of current games and only the oldest one from 2008 (Left 4 Dead) could be played fairly smoothly (low details). 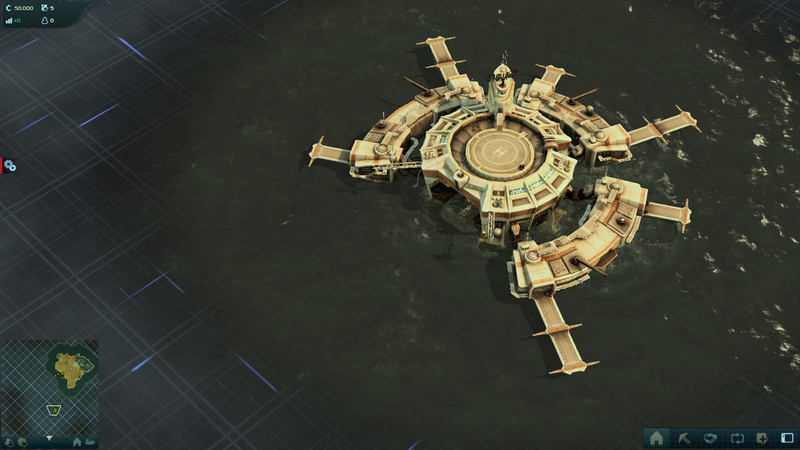 A HD 3000 system, such as the Acer Aspire 3830TG-6431 (2410M) doesn't manage much more either in Civilization 5. The car racing game, F1, manages 30 fps with the Intel graphics (ultra low, Toshiba Portégé Z830-10N, 2367M) and not only 16 fps like our test device. 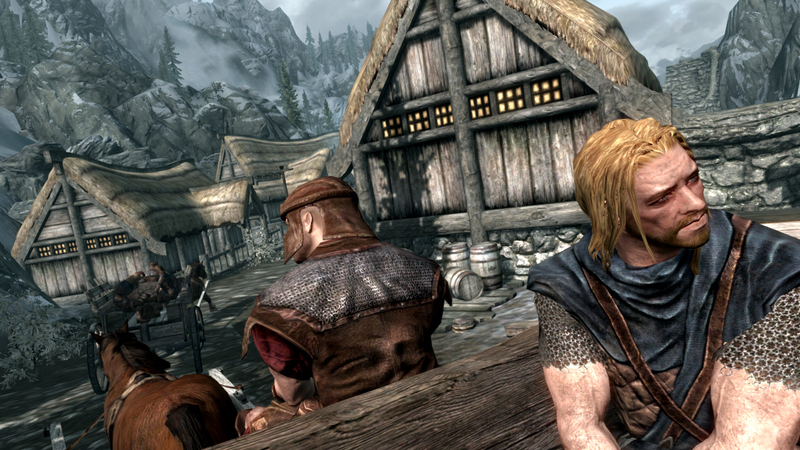 The same is evident in The Elder Scrolls V: Skyrim, which achieves 17 fps on the Toshiba Ultrabook. A 2410M processor graphics is required for 18 fps (Aspire 3830TG-6431). 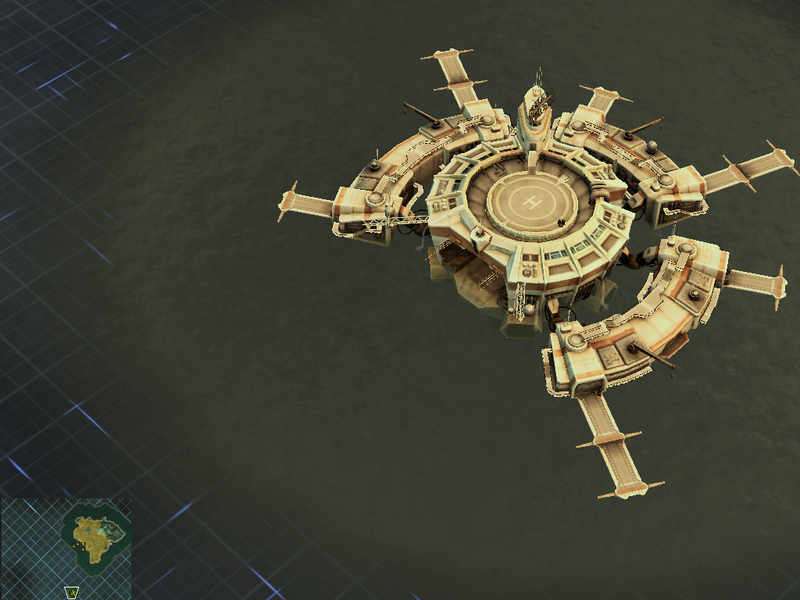 We notice the lowest difference in Anno 2070 in low details: 28 fps versus 30 with an Intel HD 3000 (@ Lenovo IdeaPad U300s, Toshiba Portégé Z830-10N). 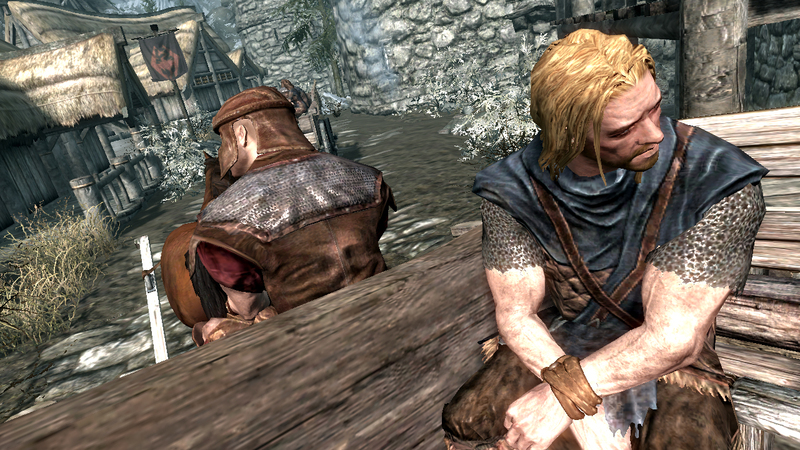 An overview of the Radeon HD 6320's (IGP) gaming performance can be found on the GPU's data sheet. The cooling system does credit to Samsung's name. It is usually silent and isn't disturbing during load. 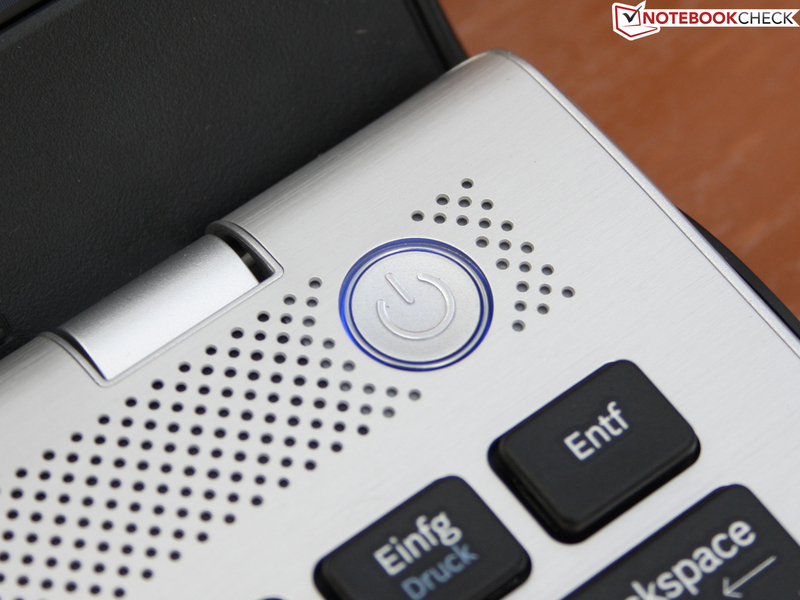 Silent Mode (FN key) that limits the processor clock to 800 MHz is available. Of course, this reduces the performance. However, this mode is not actually necessary, since the fan is always switched off in idle during normal mode. Only the HDD's noise (barely audible, 30.6 dB (A)) or its clicking (32.6 dB (A)) is measurable here. When the computer has to calculate (not full capacity), the cooling is temporarily turned on but doesn't exceed 34 dB (A). 36 dB (A) are the maximum in the stress test (Furmark + Prime95). 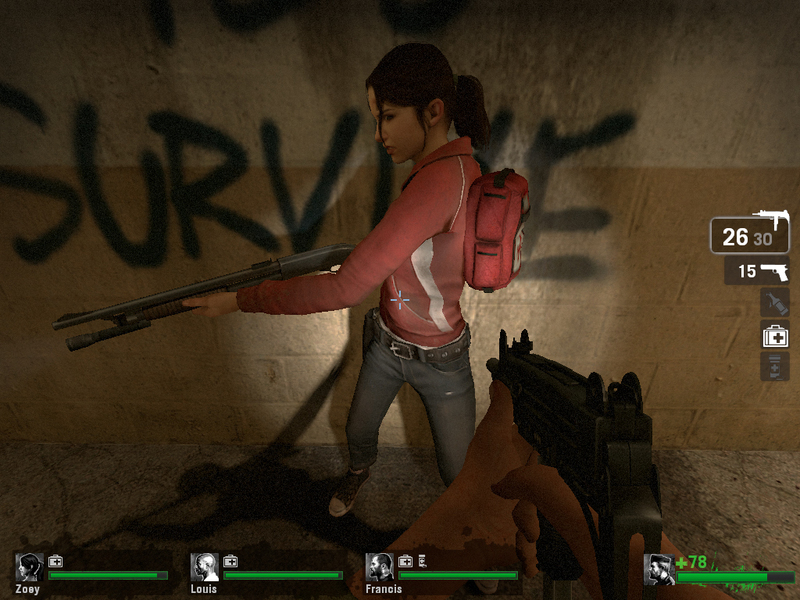 We only provoked this noise level in the stress test, which is a sooner unrealistic scenario. 33 dB (A) are more realistic for games and temporary processor load during normal mode. 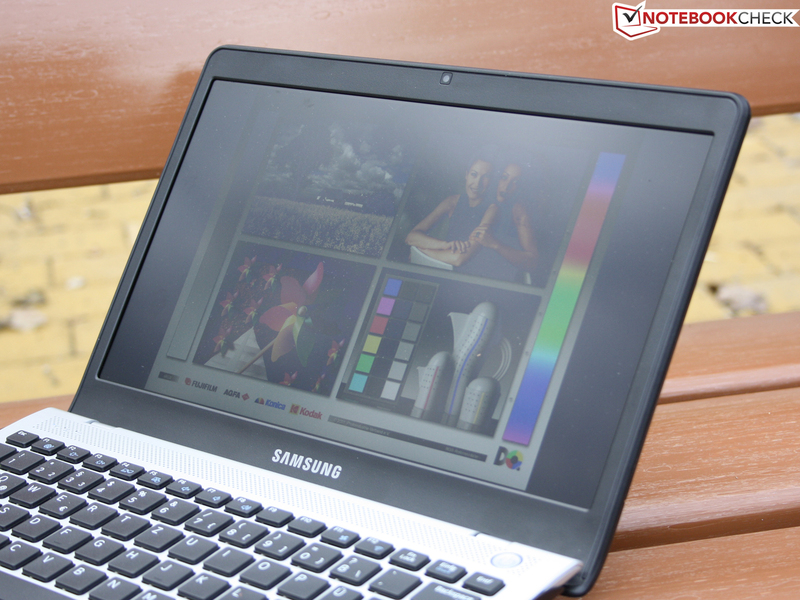 The Samsung 305U1A gets lukewarm during normal use with a lot of idling. However, a few areas on the bottom get unpleasant during constant high load. We only measure a bit over 30 degrees Celsius on the top during idle. 39 degrees are achieved selectively on the bottom. This could be due to the heat accumulation in the case (Silent Mode, inactive fan). The stress test doesn't cause heat accumulation due to the active fan, but the cooling capacity isn't sufficient to keep high temperatures remote from the surfaces. We measure up to 55 degrees Celsius on the bottom. It's positive that the wrist rest never exceeds 38 degrees. The cooling system nevertheless manages the temperatures well. The CPU maintained its default clock rate of 1.65 GHz during the multi-hour stress test (Prime95 + Furmark). There was no throttling. (+) The average temperature for the upper side under maximal load is 31.1 °C / 88 F, compared to the average of 30.7 °C / 87 F for the devices in the class Subnotebook. (+) The maximum temperature on the upper side is 38.1 °C / 101 F, compared to the average of 35.8 °C / 96 F, ranging from 22 to 57 °C for the class Subnotebook. (-) The average temperature of the palmrest area of similar devices was 28.6 °C / 83.5 F (-9.5 °C / -17.1 F). The speakers are located above the keys underneath a lattice. The speakers unfortunately only emit a thin, undifferentiated sound. There is no bass and the maximum volume distorts the little membranes. The sound can be changed via SoundAlive Effects, but it doesn't really improve it. The effects for music, movies, speech or hearing-impaired users make sense when external speakers or headphones are connected. We would recommend external speakers that can be connected via the combined headphone-microphone jack. Alternatively, the sound can also be transmitted by a TV set via HDMI. Fusion is energy efficient. We measure a low power consumption of 8.2 watts (minimum) in idle and 23.8 watts during load by 3DMark 2006. Depending on the energy profile and activity of the wireless modules, the idle power consumption can also reach up to 11.5 watts. 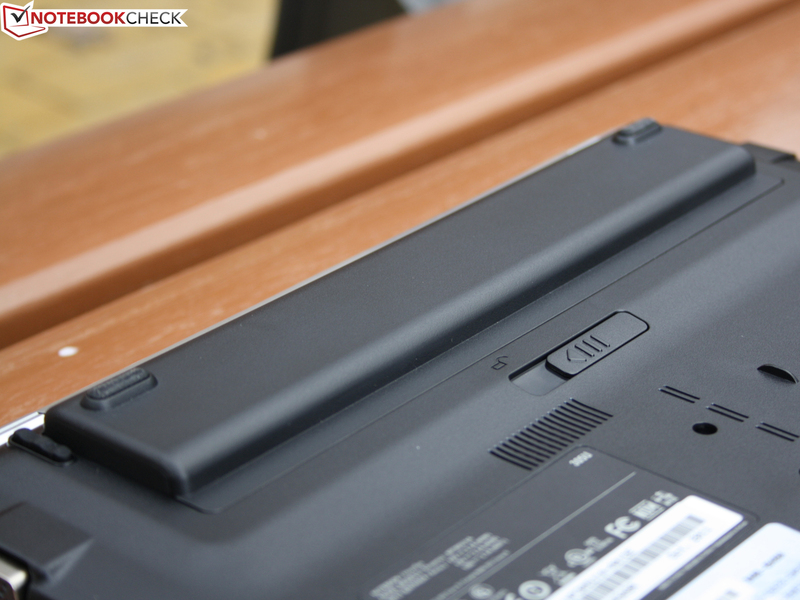 When the 11.6 inch laptop runs the stress test, the effective power climbs up to 30 watts. The battery was fully charged during the tests. 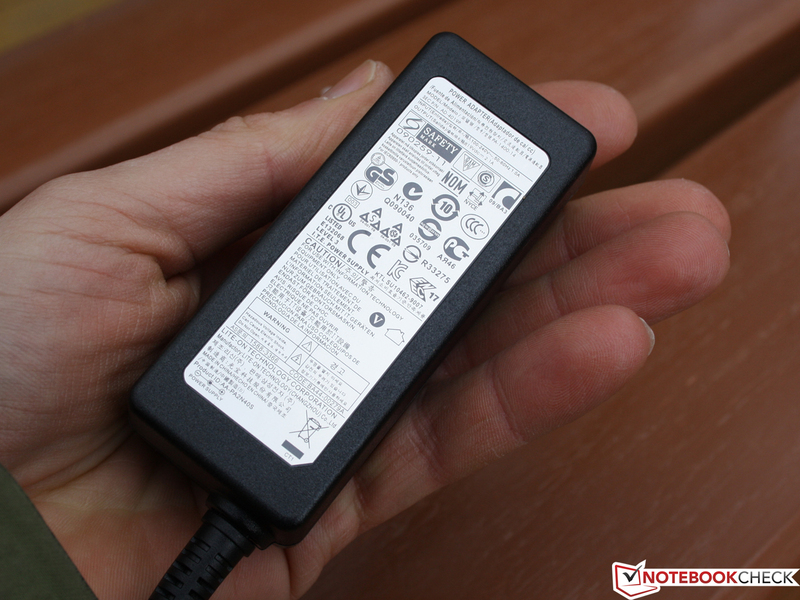 The 40 watt adapter is adequately designed for the power consumption. 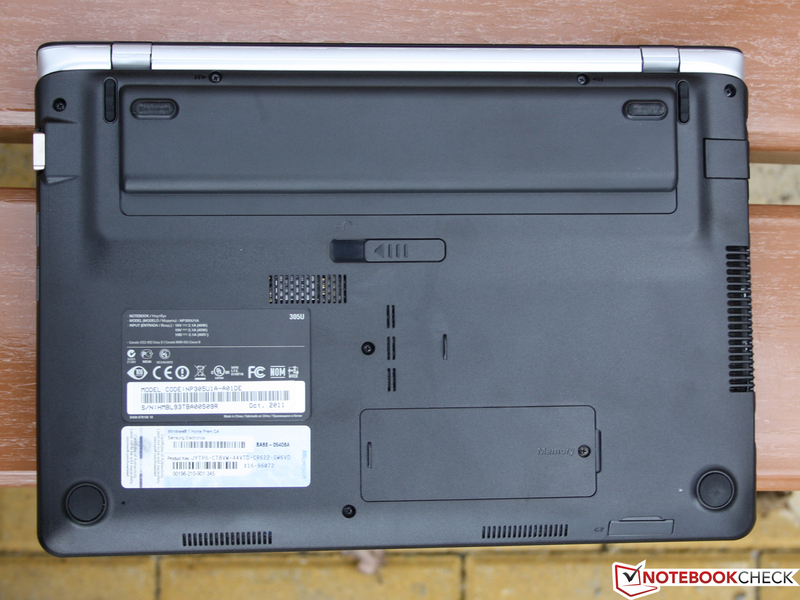 The Samsung 305U1A meets all expectations placed on a mobile subnotebook, respectively notebook more than clearly in battery life. The 11.6 inch laptop manages exactly 8:27 hours (507 minutes) of WLAN surfing at a brightness of 100 cd/m2. The real battery life could turn out a bit lower because the brightness of 100 cd/m2 is almost the lowest brightness level and won't suffice in daylight and bright rooms. The battery is first completely drained after 3:12 hours during constant CPU load, induced with BatteryEater Classic (energy mode: High Performance). 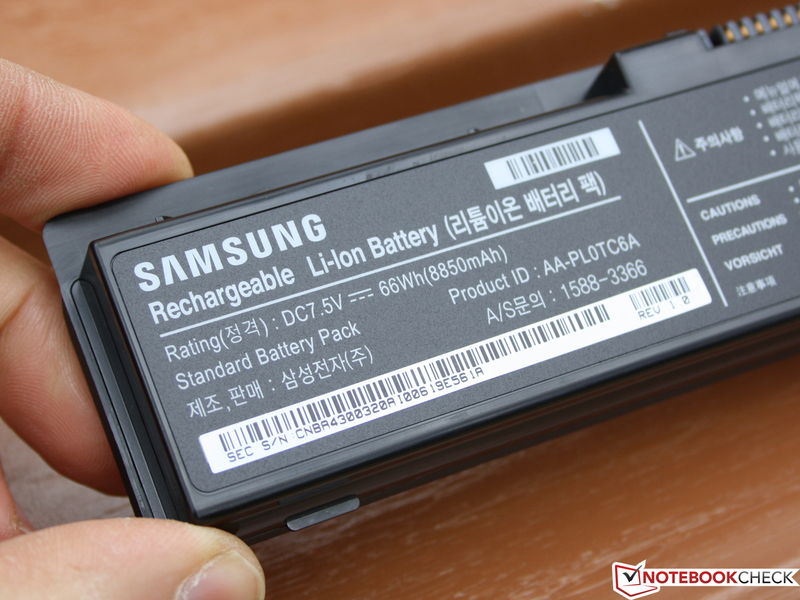 The Samsung 305U1A consumes from its high battery capacity (66 Wh) and the adaptive CPU clock in idle (800 MHz). The protruding battery and fairly high weight of 1.37 kilograms have to be accepted for this. In return, you get'll an almost perfect screen for outdoor use in the matt, bright display. Unfortunately, the 11.6 inch device needs a total of four hours to recharge the completely drained battery. The slow recharging at low amperage is beneficial for the battery cells though. Users who aren't dependent on long battery runtimes, or use the mini PC mainly with the power cable, can limit the charge to 80% with Samsung's Battery Life Extender. It extends the cells' lifespan because the electrochemical load is reduced. Samsung knows how to use the low power consumption of the new APU platform, E-450, to build an extremely mobile subnotebook. The battery life of 8:30 to 10:40 hours is undoubtedly a remarkable feat in this price range. 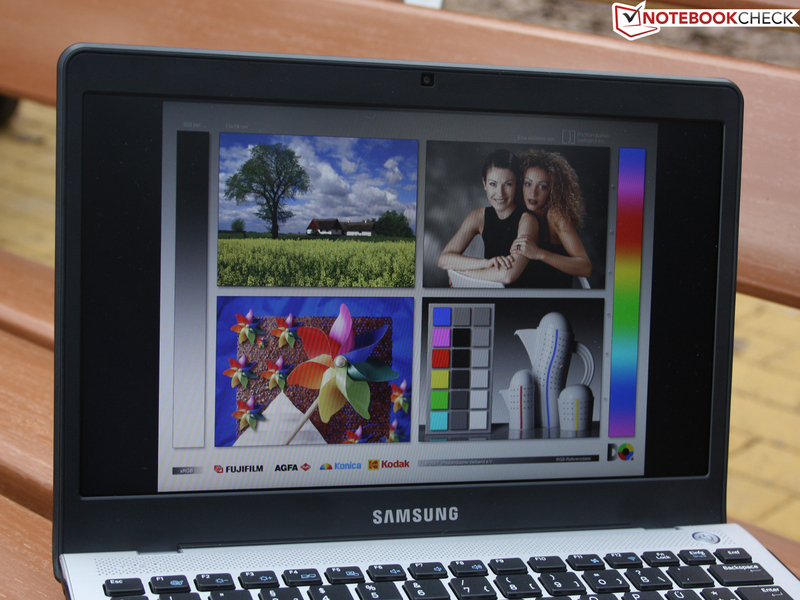 The dream subnotebook of many buyers is created with the bright and matt HD screen: Affordable (€430) and with an outdoor screen. The good keyboard, low system noise (with Silent Mode) and a comparatively fast 5400 rpm hard disk are further advantages. The latter fetches some extra points for the slow E-450 system. However, the buyer shouldn't expect big leaps: The processor is better than an Intel Atom, but a lot slower than Intel Core CPUs. 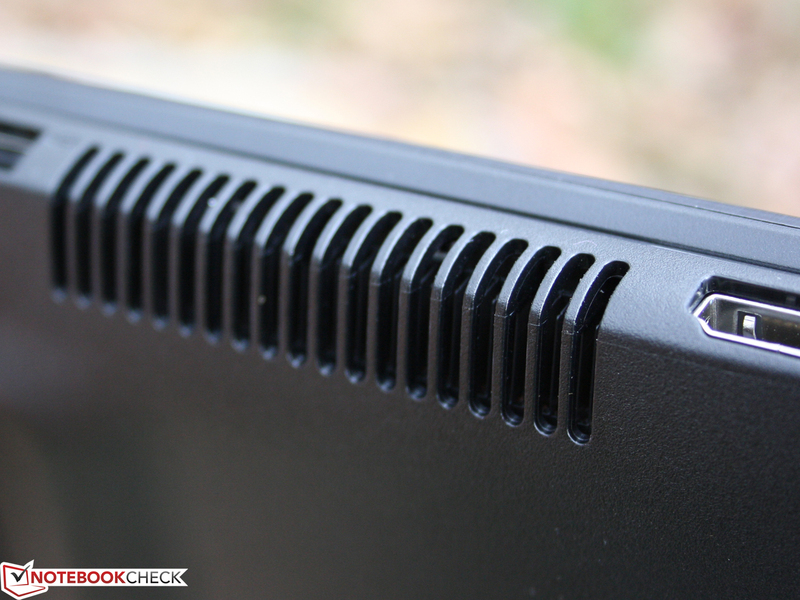 The AMD Radeon HD 6320 isn't suitable for games, but rather for rendering HD material smoothly. Buyers shouldn't expect any miracles from the hardware support in general calculations. Our random test with CyberLink's Power Director 10 failed here. 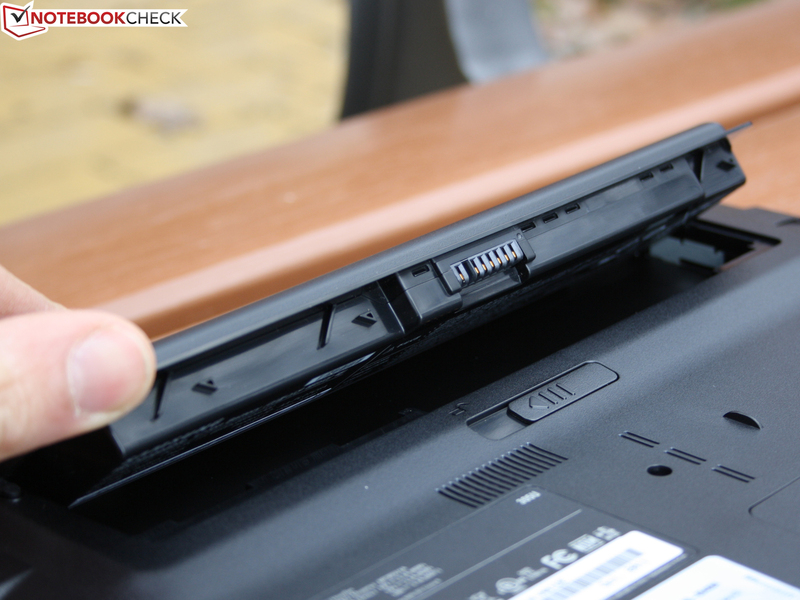 We see the biggest drawback of the Samsung 305U1A in the device's good looking, but wobbly hinge and chassis construction. The high-end aluminum finish and the impression during use don't match here. 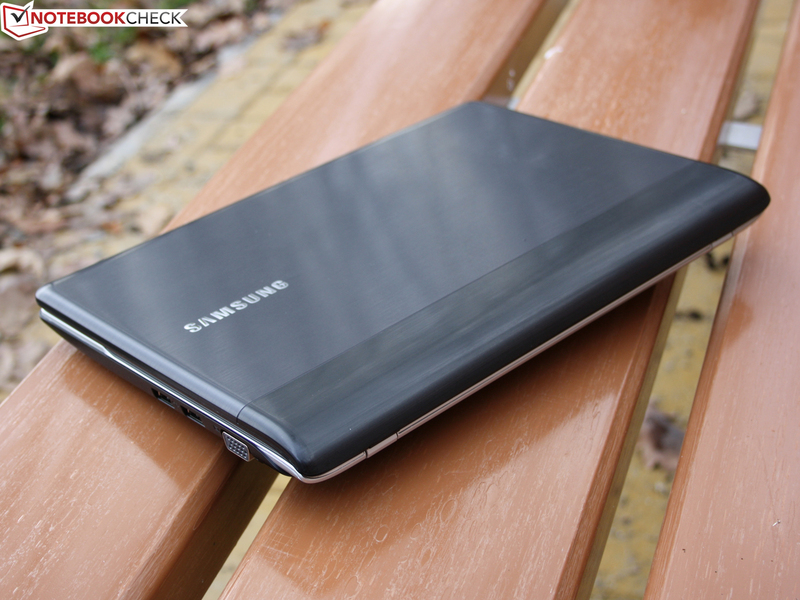 The Samsung 305U1A is suitable for everyone looking for a battery life strong 11.6 inch device for little money. However, the price war is tough. Technically similar 11.6 inch laptops are available for starting at €350. Nevertheless, the aforementioned advantages are certainly worth a small surcharge. Samsung is always good for a surprise. The Ethernet cable is plugged in after opening the interface. Three USB ports (version 2.0), VGA and HDMI round off the connectivity. The power adapter's connector is as small as a smartphone's. Thus, it doesn't fit quite tight in the case, but its function isn't affected. The matt and fairly bright TFT is a good choice for use in the sun. 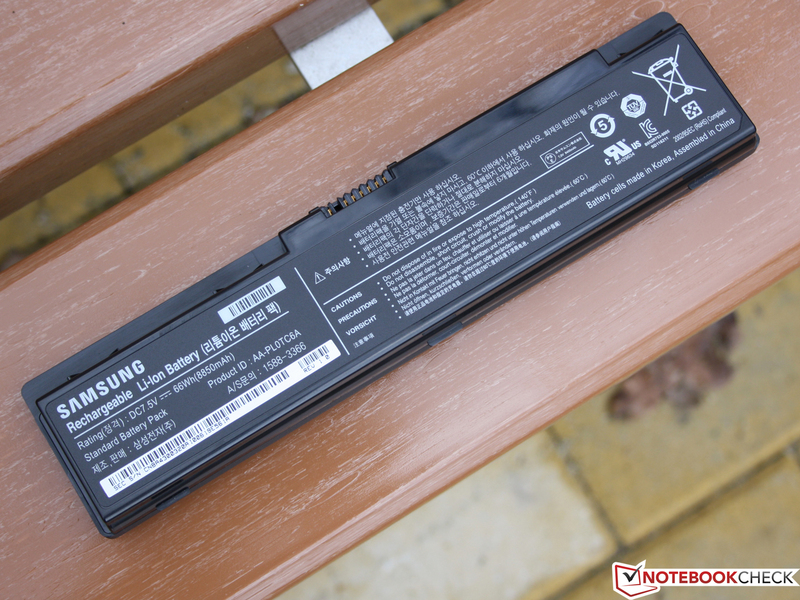 The 66 Wh battery contributes a lot to the fairly high weight of 1.37 kilograms. In return, it supplies a battery runtime of up to 8:30 hours for WLAN surfing. 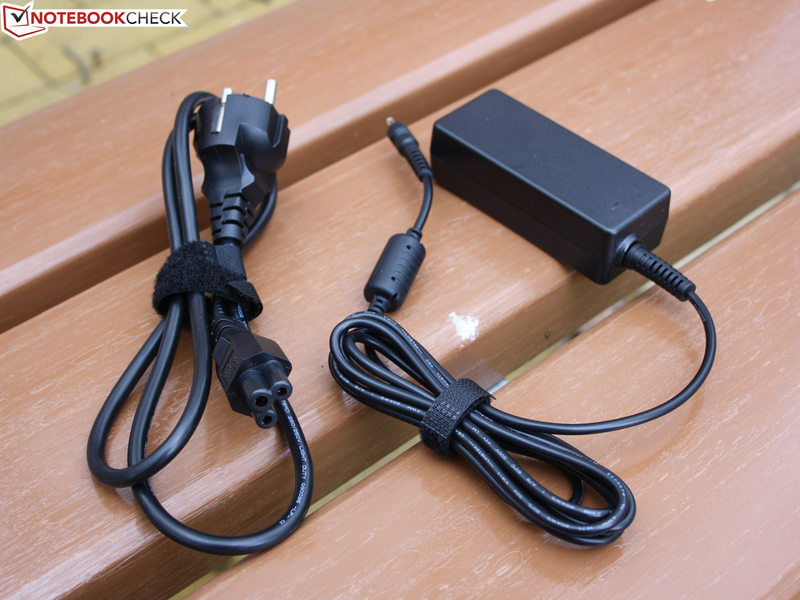 The small adapter can thus sometimes be left at home. It only weighs 167 grams without the power cable. 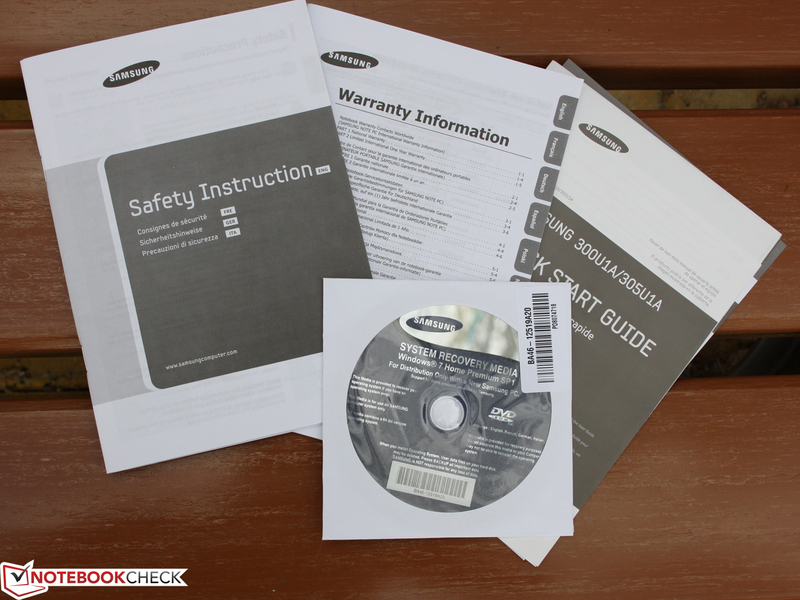 Besides the quick start guide, there is also a Windows 7 recovery DVD supplied in the box. AMD E-450 Fusion: The fast hard disk compensates the low performance of the dual core processor a bit. 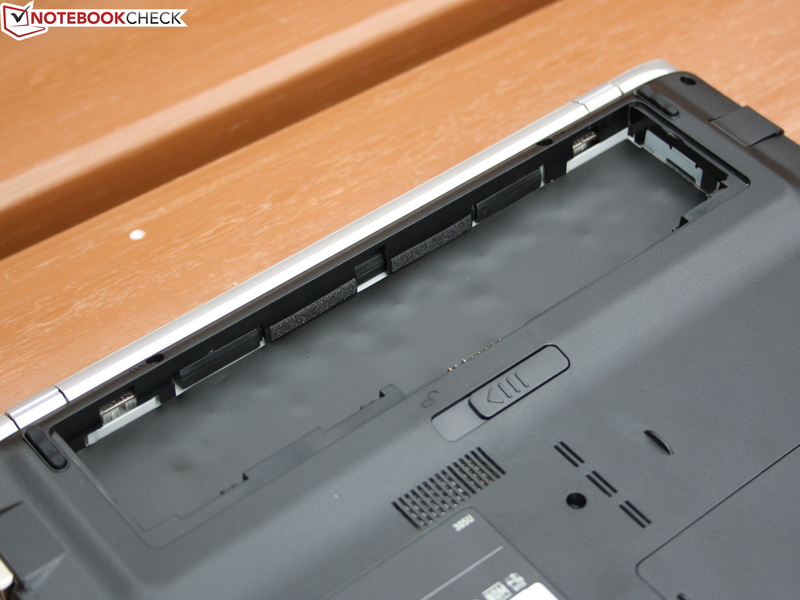 Samsung 305U1A: The pretty, polished aluminum looks can't hide the instable hinges and a wobbly chassis. That is only satisfactory. 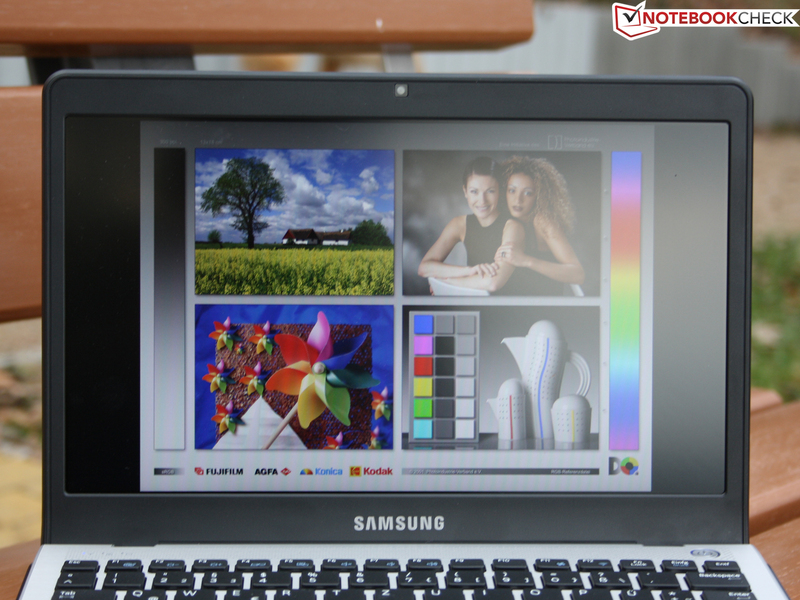 Samsung 305U1A: The matt screen has a fairly high resolution (1366x768) and is sufficiently bright for daylight use. Samsung 305U1A: Keys with a well-arranged layout and clear drop. The hole in the bottom remains. Alternative feet are beside it. and can then be taken out. which isn't (yet) talked about on the manufacturer's website. 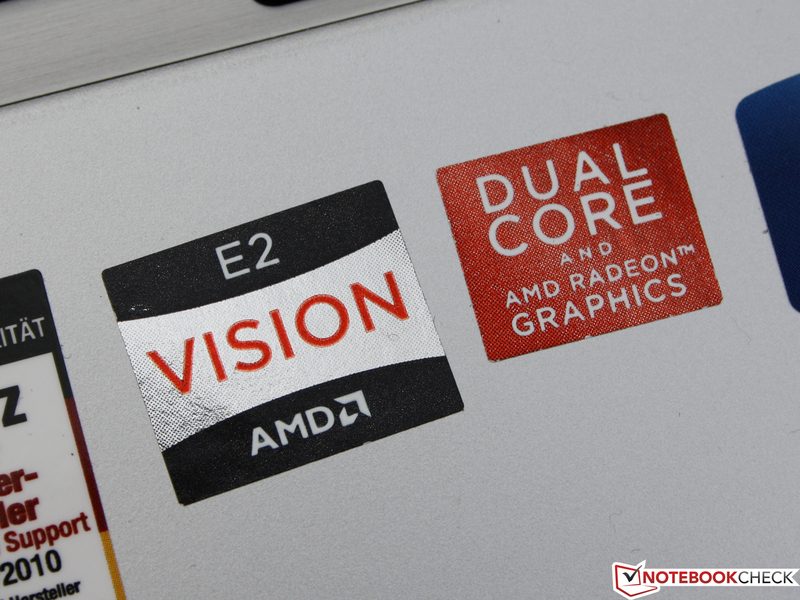 It comes along with the new AMD APU, AMD E-450, and a Radeon HD 6320 (IGP). The smart 11.6 inch device was still missing in our yearly records. We can't resist and order the Samsung 305U1A for €429. The aluminum finish of the work area makes a high-end and elegant impression. The matt surfaces prevent fingerprints and reflections. 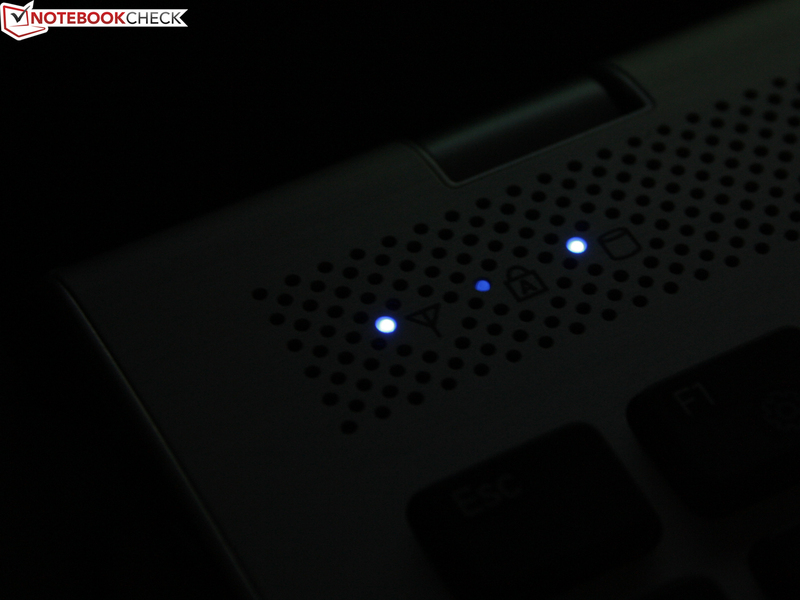 The status LEDs light up in an unobtrusive Samsung blue. 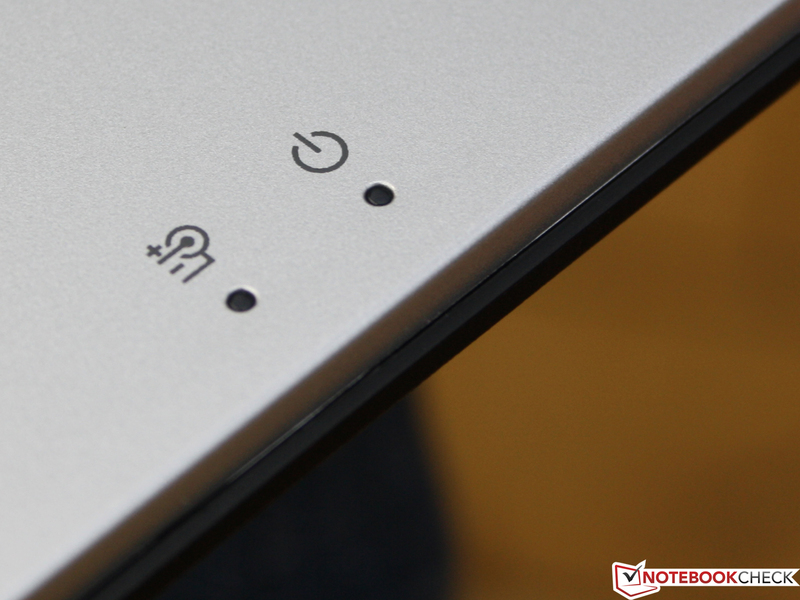 The power on button is a recognition value among Samsung's devices. Samsung makes interesting attempt in terms of looks by using a contrasting topside at the back. The protruding battery makes a bulky impression. The 65 watt hours probably didn't fit flush in the case. Samsung 305U1A: 8:30 hours of WLAN runtime due to 66 watt hours. Nice and quiet with a good typing feedback. The evidently AR-coated and bright screen. More stability. The construction isn't "bad", but there are more rigid cases on the market. The remarkable battery life and the usually quiet fan. Alternatives with HD resolution for a similar price would be the: MSI Wind U270-E4523W7H (€380), HP Pavilion dm1-4000sg (€390 Euro, now with E-450), Sony Vaio VPC-YB2M1E/S (€399), Lenovo IdeaPad S205 (€390), Acer Aspire One 722 (starts at €350, AMD C-60) or Asus Eee PC 1215B (€360, now E-450). There are equally priced 13.3 inch devices available among the low-priced subnotebooks: Lenovo ThinkPad Edge E325 with AMD E-350 starts at €414.